An elderly woman has died after being struck by a lorry on a city road. 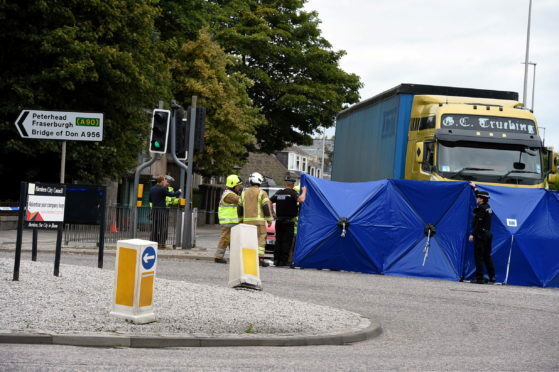 The woman was seriously injured in the collision yesterday morning at the Old Machar Drive roundabout on King Street in Aberdeen. Surrounding roads were closed off to the public as officers investigating the accident. The woman, who was believed to be in her 80s, died despite the efforts of paramedics and other emergency crews to save her life. Motorist Emma Matthews drove along the road shortly after the tragedy happened at 11:40am. She said: “I saw the driver of the lorry standing on the road weeping. Witnesses said members of the public rushed to the women’s aid in the moments afterwards and a passing police car was flagged down as it approached the roundabout. Roads Policing Sergeant Scott Deans thanked members of the public who offered to help. He said: “Our thoughts are with this woman’s family and friends at this very sad and tragic time. The busy road was closed throughout most of the day with buses and cars diverted away from the roundabout causing huge traffic delays as rush hour approached. Police investigations into the cause of the accident were continuing last night and officers urged witnesses to get in touch with information. Local councillor Jim Noble said a full review of safety at the roundabout would be carried out. Police attended a separate crash involving a lorry earlier in the day.